Since I decided to do breakfast instead of dinner for Valentine’s day, the tablescape is simpler. What better way to put a little romance on the table than with these pink depression glass dishes, a pattern called Cherry Blossom. 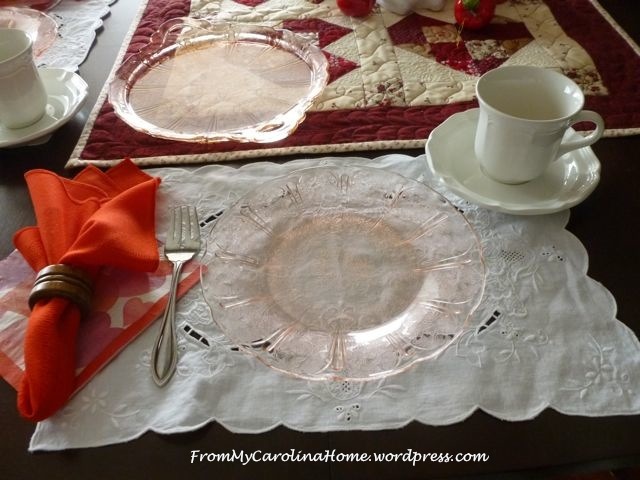 Aren’t they sweet on the pretty white placemats? There are paper heart napkins under the red linen ones, just to add a few more hearts to the table. The centerpiece is really on the side, with white and pink tulips left over from my Spring Wreath from last spring. They are in a Fenton antique milk glass vase with a ruffled edge that has pink on the inside. The reindeer now has apples in his planter. I put a few on the table too. 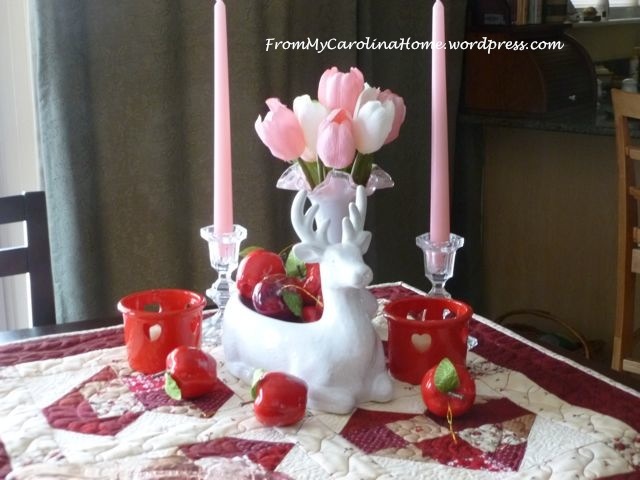 The table topper is my Hearts Around that I shared a few posts back. There are two places set for this breakfast of Popovers with Black Cherry Creme. The Cherry Blossom handled tray will hold the popovers. Hope you have a heart warming Valentine’s day. I love that tablescape. Brings back such fond memories of special lunches at my grandmother’s. She always had beautiful china or depression glass and placemats etc. for “tea parties” at her house. Now I want to recreate that with my granddaughter. What better time to start than this Valentine’s Day! Everything looks beautiful for a Valentine’s Day breakfast. 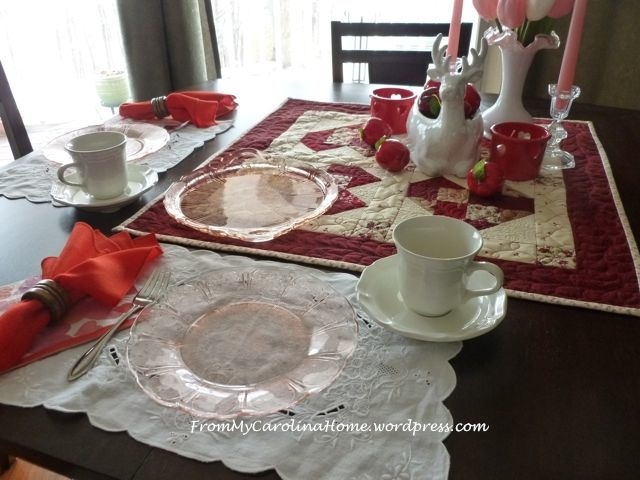 The pink plates are lovely and your heart table mat looks beautiful in the center of the table. Have a wonderful Valentine’s Day! Hugs! Beautiful! Simply beautiful! You’ve inspired me to step it up a notch when I set my Valentines table…. Love the Table Setting! Very Romatic! Happy Valentines Day to you & yours! 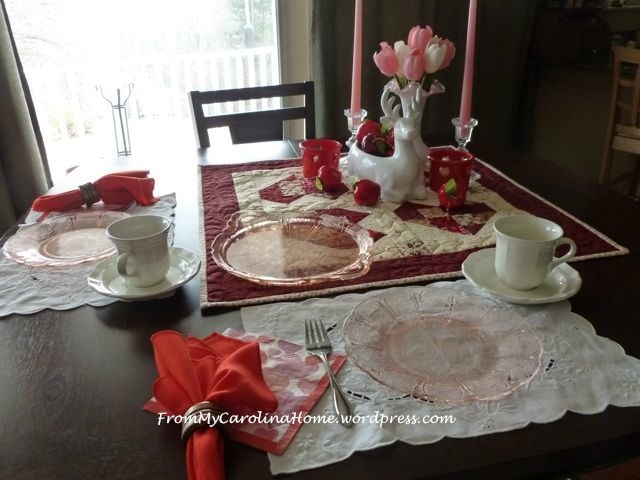 Your table setting is so lovely-just perfect! 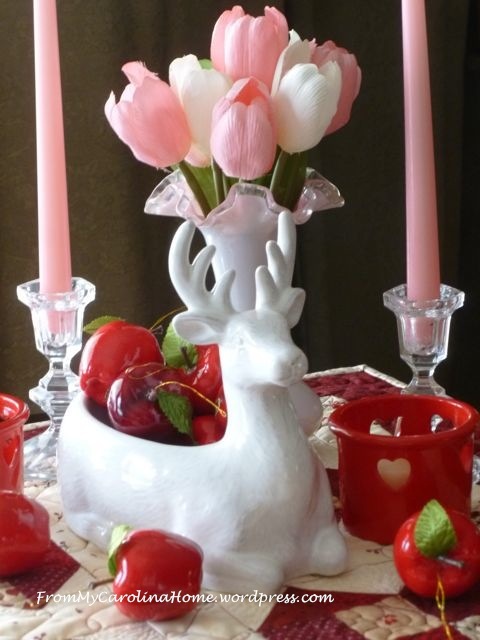 Stunning set table.Have a great Valentine day! Very sweet table and I love the quilt. I love your table topper and the popovers sound so yummy! Thanks for sharing with SYC.